I’d been to see a geezer selling reclaimed floors out in the wilds of E4.I suggested that made C come with me. He was thrilled. Amazing that he has been in London for nearly thirty years, but has never driven through the joy that is Palmers Green, viewed from the highway to heaven that is the A406. I’d been looking for something worn, something authentic, something better than the vile laminated mock wood/red carpet combination I’d inherited from my taste-free vendors. Hunting around on the interweb, I came across a man selling the original floors from the old Lewis’s department store in Liverpool. The one with the Epstein statue of the naked man outside. Installed in 1927, it was just what I was looking for. The floor. Not the man. Job done, my thoughts turned to food. Because I was already in an E postcode, albeit on the outer planetary ring, my thoughts turned to the City in general and Bermondsey in particular. I’d felt like I’d missed the whole happening Bermondsey vibe. That’s because I have. And I thought I might remedy it by a visit to Casse Croûte, or Jose. But it was not to be. I hadn’t realised that the car is an unwelcome guest in the London Borough of Southwark, and I wasn’t prepared to pay a tenner to park in a dodgy, illegal school playground car park. Clerkenwell, I thought. At least I knew I could park there. The Quality Chop House, perhaps, or, failing that, Caravan. But what was I thinking? Moro was just around the corner and it was 2pm and it was a warm Friday and I was feeling lucky. The kitchen closes in half an hour, he said, so you’ll have to eat quickly. Ha. He doesn’t know who he’s dealing with. If we’re lucky, the food might actually touch the sides of my mouth, rather than going straight down the throat-funnel. I practically inhale my food. I’m not proud of it. And I do try not to. I tell myself to chew. Never mind thirty times (ridiculous) – two would be an achievement. I sometimes even put my knife and fork down, between mouthfuls. I often notice that my dining companions are only a quarter of the way through their meal, when I’m ninety per cent done and I have to go into that embarrassed and pathetically obvious slo-mo eating/ chewing/cutting-into-small-bits-to-make-it-last-longer thing, so that I don’t finish my plate before they’ve even reached the halfway point. And then to make it worse, just when I think that they are catching up and I take the last few mouthfuls, they suddenly stop and leave some, taunting me in a passive aggressive manner with their leftovers and their restraint. And I always clear my plate, rendering it spotless, with bread. Obviously. I’ve been going to Moro since it opened. 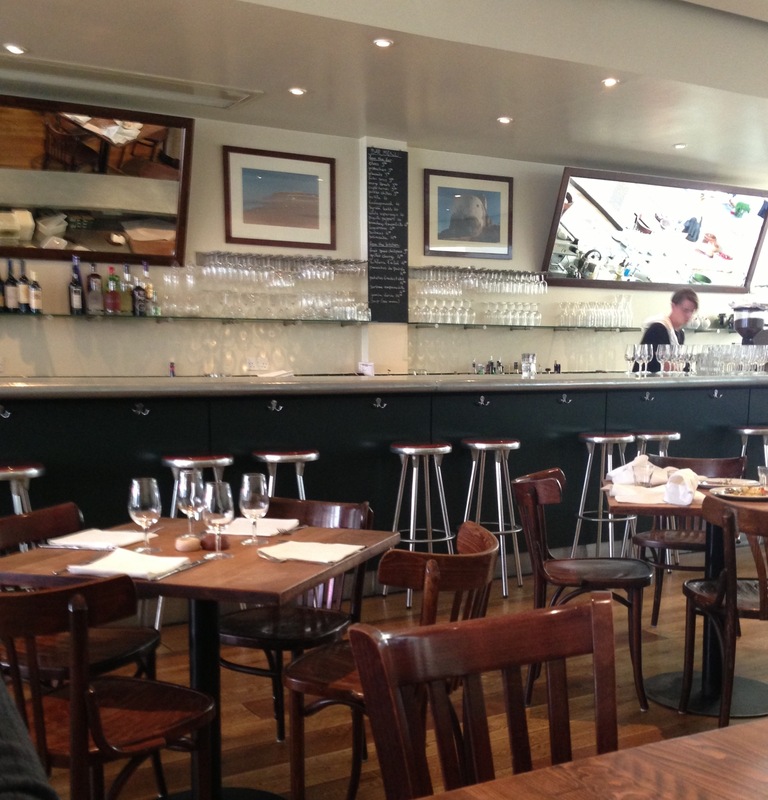 For a little while I lived up the road and it was one of my regular haunts, but having moved west, I can’t hear the siren call quite as strongly as when I lived five minutes walk away. And I had forgotten how much I always enjoy it, with its deceptively simple food. Superior cooking you could do at home from one of their two excellent cookbooks. The sort of food I love to cook. And eat. For anyone who has been living on another food planet, this is the brainchild of Sam and Sam Clark. 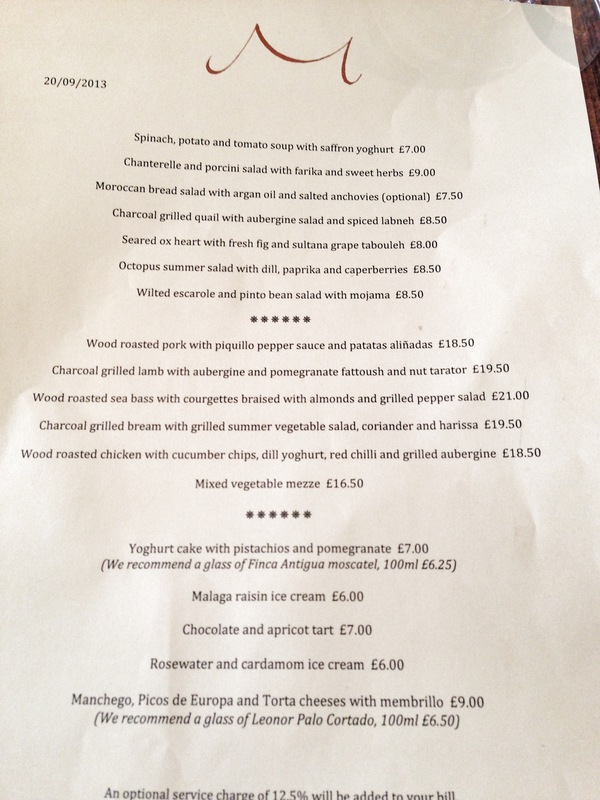 A thousand years ago they worked for the River Café and you can see the same aesthetic here – top quality ingredients, not messed about with too much. As they say on their website, they set out to discover the abundant flavours of the southern Mediterranean and travelled through Spain, Morocco and the Sahara for three months. That this has been going strong since 1997 and hasn’t changed particularly since then speaks volumes. This is a confident restaurant. It knows its audience and it does its job spectacularly well. I’ve never been disappointed. I ordered the bread salad. Hey, it had bread in it. But before that I must mention the house bread. Bread worth crossing London for. Superb sourdough, served with a sharp and peppery olive oil. I hoovered it down. I’d missed it. Reunited with the bread of memory. Bread of heaven, feed me now and evermore. And the bread salad, great strong flavours. 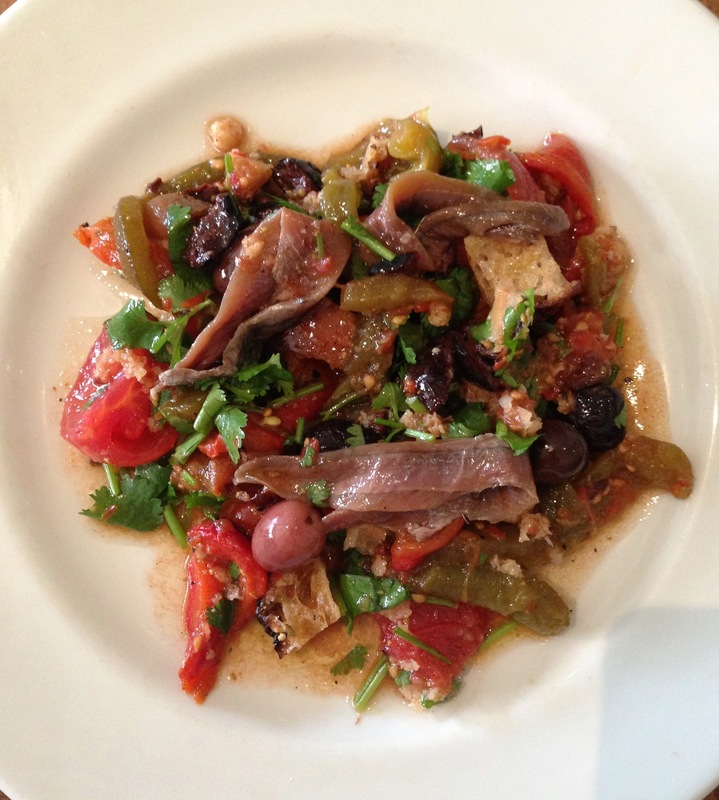 Strong anchovies, olives and peppers with soft lamb’s lettuce. A little heat from paprika and this was a gutsy dish, full of flavour. 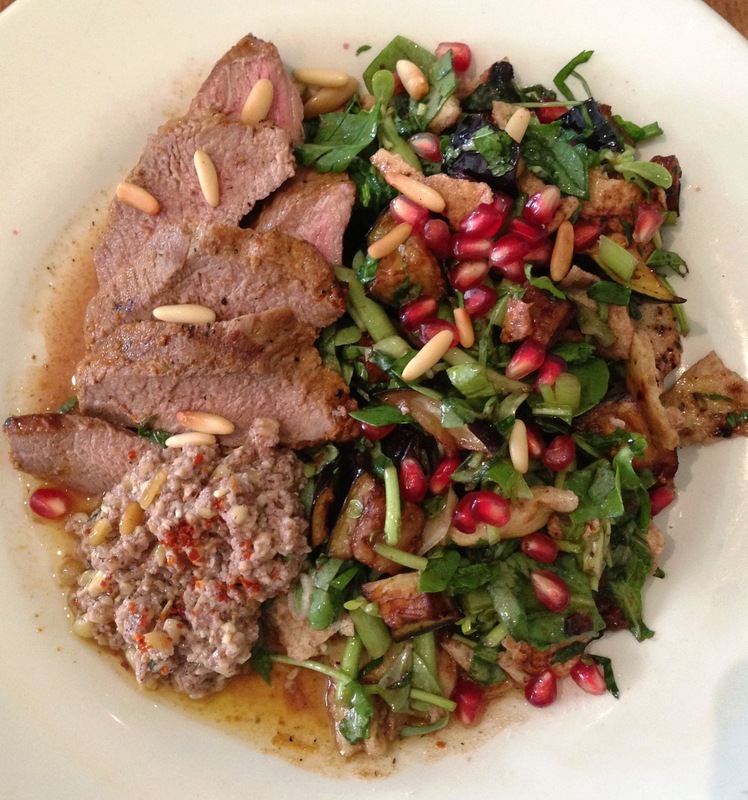 And then charcoal grilled lamb and nut tarator, with aubergine and pomegranate fattoush. Which is a bread salad. I loved this. The bits of toasted bread in the fattoush were crisp and warm; the lamb perfectly cooked and with superb flavour, firm and tasty and the aubergine soft and not greasy. Simple but completely perfect. Nothing too much, nothing out of place, seasoning spot on. I mopped the plate clean with yet more bread. It would have been rude not to. 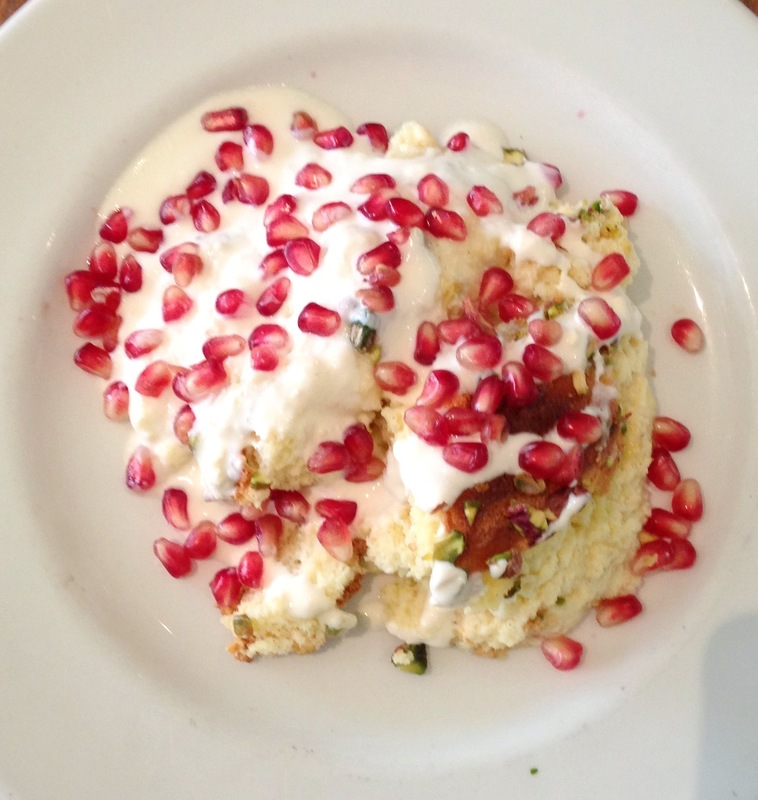 And then, because I really needed and there was no dessert with bread in it, we had yogurt cake with pomegranates. A soft lemon-y cheesecake-type texture. Light, delicate and delicious. I’ve made it at home but it tasted better here. And after all that, no pictures of the bread. I’m afraid that I was too busy eating it. I’m deeply disappointed that they didn’t serve any bread with the cake :( For mopping up the yoghurt, you know?